LSNW prides itself on owning state-of-the-art 3 and 5 axis CNC machines, all stringently serviced and maintained to ensure accuracy and reliability are assured. These machines are capable of cutting most materials at high speeds, utilising the latest in cutting tool technology and the most 'up-to-date' Delcam Powermill machining software. All the machines are networked so programs can be transferred onto machine hard drives in seconds. Using remote software, machine environment digital cameras and tool changing facilites enables us to utilise unmanned machining at every opportunity 'lights-out machining'. Allowing time savings to be transferred into cost-savings, which are then passed on to the customer. 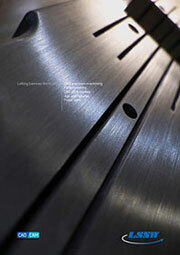 High speed machining is not just about cutting faster. H.S.M. 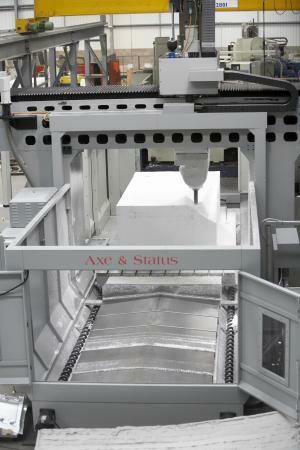 is about harnessing higher speeds and feed rates to produce parts that would be impractical to machine at lower speeds. The tool paths are the key to this. Only the right tool paths can turn faster into better. To achieve this we have 6 seats of the number-one CNC machining software, Delcam Powermill, and the expertise through relentless training to implement it correctly. All the machines have service contracts and are maintained by the machine agents. These contracts cover each machine in the event of major breakdowns, guaranteeing they are back up and running within 48 hours. Ensuring no major delays to the tight delivery schedules expected by our customers. LSNW are proud to have now been approved by Lloyds Register Quality Assurance Limited to the following quality management system standards: ISO 9001:2015 AS 9100 Revision D.
Salt Pour / Ceramic Core Moulds. Copyright © 2004 - 2019 Lofting Services North West Limited. All rights reserved.